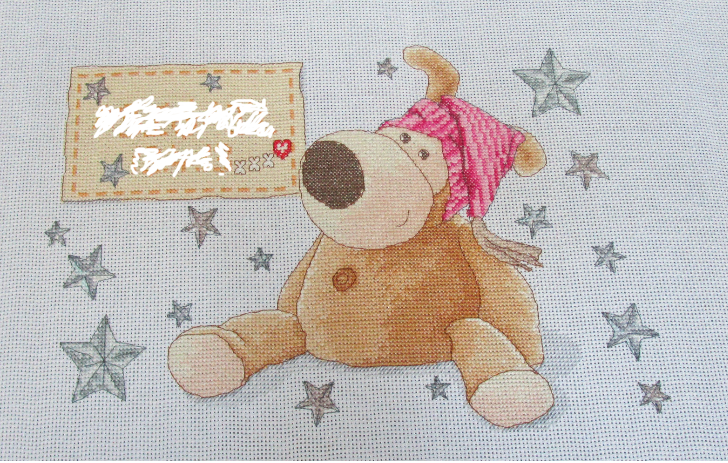 Bedtime Boofle Bear DMC BL1014/48 Sampler | Cross Stitching Heaven. Finishing cross stitch projects for you. I have now completed my next project, another lovely kit by DMC, called Bedtime Boofle Bear. It will now be winging its way back to its owner in the UK. Dmc have a wide range of beautiful cross stitch kits which you can view or purchase here. You can buy this kit here. and contains the blank Aida, needle and presorted good quality threads along with fully charted instructions. The kit is quite easy to complete and I would suggest that it is ideal for anyone who has had some cross stitch experience because there are some half stitches and quite a lot of backstitch detailing which I found quite fiddly particularly on the stars. I preferred completing each star as I went because the thought of having to go back to it was quite daunting. For customer privacy, I have had to scribble out the name and date of birth of the lucky little girl. I did find that the name box on the sampler only allows you to place your child’s first name. However, with some adjustment, I managed to fit the date of birth also as requested by the customer. There are several beautiful Boofle Bear kits by DMC, like this one – which you can view by clicking on the large image above. Having looked at them I think Bedtime Boofle Bear, for me, is by far the cutest. As with most of the DMC kits I have done, this one had easy to follow instructions and stitching charts. As with all DMC kits, the threads were of a very high quality. If you would like to purchase this kit for yourself you can do so by clicking the link in the picture at the top of this page. Previous Successfully Complete a Cross Stitch Project. Successfully Complete a Cross Stitch Project. Cross Stitch Pako Dolls House. Successfully Complete a Cross Stitch Project. | Cross Stitching Heaven. on Cross stitch finishing. Contact page.